Discussion in 'General Discussion' started by Parralax view, Nov 9, 2018. Bruno Mars Loud that's what. Last night he started a 3 show stand at Aloha Stadium. I live almost 2 miles from there and last nights concert was so loud, that individual voices, instruments, etc. were clear as it being almost in my back yard. Too loud is an understatement. In my time here, the Eagles, Stones, U2, and UH football games are held and I never heard a cheer, a note, nothing. Last night at 10:45pm, with windows closed, ac on, and bedrooms on the opposite side of the house from the sound was still like a boom box outside your window. Black Sabbath at the Whiskey in Hollywood on their first tour in the US. We had to leave and stand outside since it was blasting us so badly. Loved it. Wish I could do it again though!!! Hanging on the front of the stage many years ago for Motörhead........practically all I heard that night, and many days after, was his bass blazing through a Marshall stack. Ungodly loud. Third row, Slayer on the Clash of the aTitans tour.... completely deaf by Manditory Suicide. DISTORT6, Alnus Rubra and Glide-bpm like this. I've been to ZZ top, Journey, Pink Floyd among others. The loudest I've attended was REO speedwagon! Alnus Rubra and markd21 like this. Frehley's Comet, 2nd row at the Agora Ballroom in Hartford, again front row at Axis in Boston. KISS at the Springfield Civic Center ...somewhere on the floor ...close enough for the wind from the speakers to blow our lighters out and packed so tight I couldn't get my feet flat on the floor. Those shows left me ringing for days. I've been to plenty of LOUD shows, but the one that sticks in my mind is KISS. Pyscho Circus tour, in Peoria, IL. We had 2nd row seats on the right side. Far enough to the the right that we were right in front of the PA stacks. Holy crap, was it painfully loud. Funny, saw them on the next tour, 3rd row center. That was one of the most perfect sounding shows I've ever been to. It was like we were getting to hear the stage monitors. Not loud, at all. Am I the only one who wears ear plugs to shows and Nascar races? toothace and DISTORT6 like this. Pat Travers playin a club in Chicago back in the lats 80s. It was Sooooooo loud I thought I was going to throw up.....seriously. I had to leave for a while. Ted Nugent Super Bowl of Rock - So loud outside you couldn't yell into a persons ear next to you !!! The loudest I've attended was REO speedwagon! We opened for those guys at a local Ribfest in the mid 90's. We were the first band of the day, but we got full PA (gotta test it out, you know?). 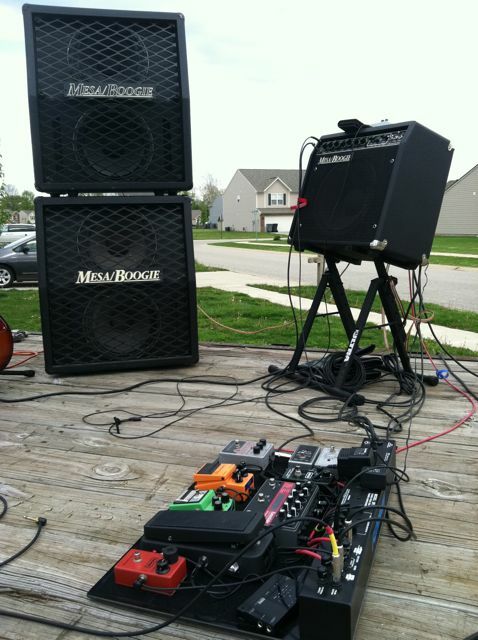 My guitars were so loud that I was in agony - and we were playing outside!!! It was one of the most miserable gigging experiences of my life, lol. Reminds me of seeing Steve Vai when he had Devin Townsend singing for him. Every time Devin would scream my body folded inward and my I would slightly lose consciousness. Again, that was outside!!! It sucked. We left. Celtic Frost on their "Monotheist" tour. I was SOOOOOOOOOO freaking excited. I loved those guys forever. It was SOOOOOO loud and SOOOOOOOO heavy that my guts were traumatized. I had to leave. I felt SOOOOOOOOO lame, and actually got depressed because I couldn't handle it. But, the Bruno Mars thing sounds stupid!!! I would have gone postal on Bruno if that happened here. Boston and Sammy Hagar...late 70's...and Def Leppard. Pyromania Tour, crazy loud. But great show! As crazy as this sounds (pun intended), the loudest band I ever heard was..........The Moody Blues. Dust from the rafters, which must have accumulated for years and survived a multitude of concerts, rained down on our heads. Ridiculous. Prolly in my Basement ............ You know who you are! DreamTheaterRules, Boogie, Glide-bpm and 2 others like this. Dammit!!! Hans turned me up! Now, where did I put my hearing aids? Boogie and markie like this. Nope. Earplugs at shows, scanner headphones at races.